There is channel off the Nissequogue River that I like to explore when the tide permits. The channel – maybe it’s a creek – offers many photo ops for us nature lovers. It’s set off from the main part of the river so it rarely ever gets any traffic and that makes it popular with a number of species. Black-crowned and Yellow-crowned Night Herons seem to like the spot as well as their somewhat less shy cousins, Great and Snowy Egrets. It’s a reedy area so it’s also good for Red-winged Blackbirds. Occasionally, but not often, I’ll find a Snapping Turtle there. There is also a family of muskrats living along the creek. If one is early enough and quiet enough, one might be lucky enough to see one or more of these critters. I’ve noticed three distinct sizes: big, medium, and small. The photo above is of one of the medium-sized ones. I came across this muskrat in a marshy channel where I can usually find mallards hanging out. If you follow the channel in, you come to a dead end where, sometimes, if I’m very lucky, I get to see a muskrat or two. In my experience, these critters are very shy and I count myself more lucky than stealthy when I manage to get a shot of one. As it was, this one hung out, motionless, for three or four minutes before deciding he wasn’t fooling me. 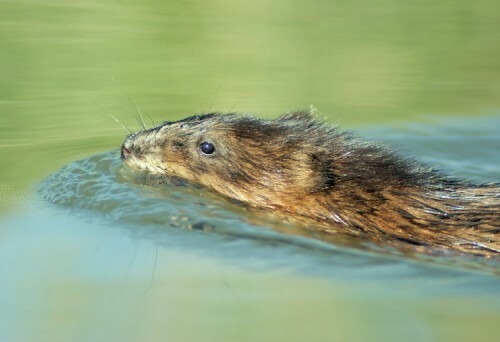 Then he dove under the water, perhaps to an entrance of a burrow. 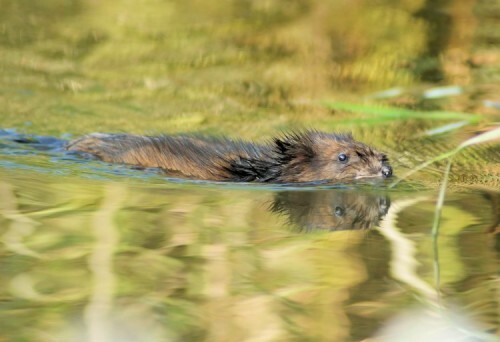 Muskrats often dig openings to their nests below the waterline, and on many occasions I’ve seen them swimming along and diving when they reach the riverbank.